What will 2014 bring to American Cattlemen? The article below is provided in its entirety. Somehow I was not even shocked to see the Mother Jones headline . . .
Should We Fight Climate Change By Taxing Meat? Decreasing the global cattle population would reduce emissions of methane, a powerful greenhouse gas. This story originally appeared in the Guardian, and has been reproduced here as part of theClimate Desk collaboration. Meat should be taxed to encourage people to eat less of it, so reducing the production of global warming gases from sheep, cattle and goats, according to a group of scientists. Several high-profile figures, from the chief of the UN's climate science panel to the economist Lord Stern, have previously advocated eating less meat to tackle global warming. There are now 3.6 billion ruminants on the planet–mostly sheep, cattle and goats and, in much smaller numbers, buffalo – 50% more than half a century ago. Methane from their digestive systems is the single biggest human-related source of the greenhouse gas, which is more short-lived but around 30 times more potent than carbon dioxide in warming the planet. Emissions from livestock account for 14.5% of all human-caused greenhouse gases, according to the UN. It estimates that this could be cut by nearly a third through better farming practices. Pete Smith, a professor of soils and global change at the University of Aberdeen, and one of the authors of the report, said: "Our study showed that one of the most effective ways to cut methane is to reduce global populations of ruminant livestock, especially cattle." He said methane from livestock could only be reduced by addressing demand for meat at the same time. The scientists say not enough attention has been paid to tackling greenhouse gases other than CO2, especially in the ongoing UN climate talks, which last convened in Warsaw in November. The only way the world could avoid dangerous tipping points as temperatures rise would be by cutting methane emissions as well as CO2 emissions from sources such as energy and transport, they argue. Reducing livestock numbers, they point out, would also avoid CO2 emissions released when forests are cleared for cattle farms. William Ripple, a professor in the College of Forestry at Oregon State University, and another of the authors, said: "We clearly need to reduce the burning of fossil fuels to cut CO2 emissions. But that addresses only part of the problem. We also need to reduce non-CO2 greenhouse gases to lessen the likelihood of us crossing this climatic threshold." The farming industry said the tax proposal was too simplistic. Nick Allen, sector director for Eblex, the organisation for beef and lamb producers in England, said: "To suggest a tax is a better way to cut emissions seems a simplistic and blunt suggestion that will inevitably see a rise in consumer prices. "It is a very complex area. 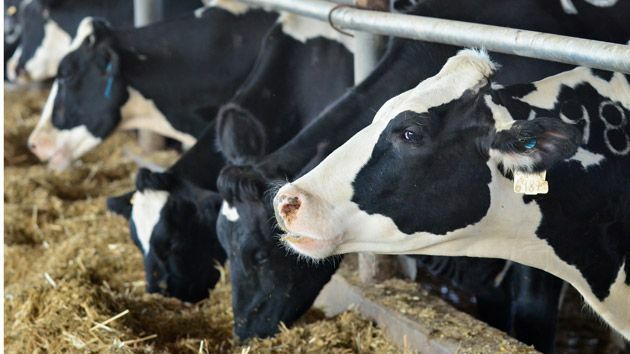 Simply reducing numbers of livestock–as a move like this would inevitably do–does not improve efficiency of the rumen process, which takes naturally growing grass that we cannot eat and turns it into a protein to feed a growing human population." Allen said reducing emissions was an important goal for the industry. He added: "Grazing livestock have helped shape and manage the countryside for hundreds of years. They bring significant environmental benefits that can significantly mitigate the negative effect of emissions. It is unfortunate that in recent years they have become an easy scapegoat for emissions, despite the fact that the livestock population is generally falling."